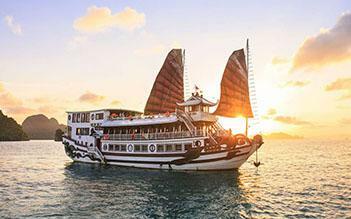 With 3 days trip on Paradise Luxury cruise, you will have chance to visit Halong Bay with the most beautiful route: Surprise cave - Luon Cave - Cua Van floating village and Titop Island, as well as enjoy the best services and interesting activities on boat. 07:45 Continental breakfast will be served in the restaurant. 09:00 Hike to the top of Titov Island for stunning panoramic views of the Bay. 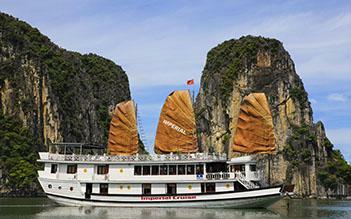 After your hike, go for a refreshing swim in Halong Bay’s emerald waters or sip from a coconut in the shade. If you choose to stay on board, book in for a pamper session in the Le Parfum Spa*. 10:30 After visiting the must-see Titov Island, your next stop will be Trong Cave, in Bo Hon Island. Inside the cave, all visitors will be surprised by so many stalactites hung down from the ceiling. This is also an ideal destination for those who would like to kayak. 12:00 After your morning excursions, re-energize yourself with a fresh and delicious lunch in the restaurant. 14:00 The largest of five remaining floating fishing villages in the Bay, you will visit Cua Van Floating Village by bamboo boats rowed by locals, or you can opt to kayak. Wave to friendly locals as they go about their daily lives, which have remained largely unchanged for centuries. 17:45 Paradise Luxury will anchor overnight at Coconut Tree Island. This is the perfect time for you to enjoy a cocktail or two as the sun sets over the karst landscape. Foodies can partake in Vietnamese cooking demonstration before dinner, and try a pre-dinner cocktail* or two. 19:30 Savour your last dinner in the restaurant, choose to eat in your cabin or on the sundeck - it’s completely up to you. After dinner, if you haven’t tried squid fishing, this is your last chance. Or you may just want to wind down with a movie in the restaurant. 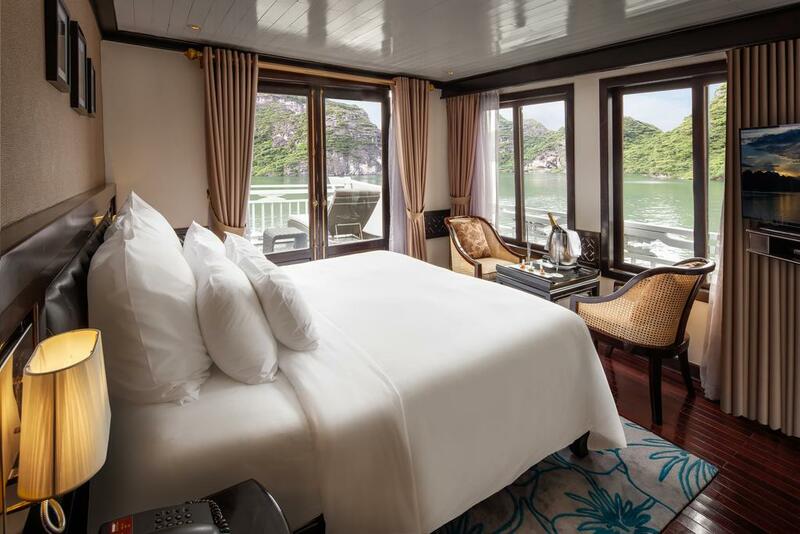 06:30 Begin your last day in Halong Bay with a calming Tai Chi session on the sundeck, followed by a light breakfast, coffee and pastries. Spoil yourself and book in for one last spa treatment at Le Parfum Spa*. 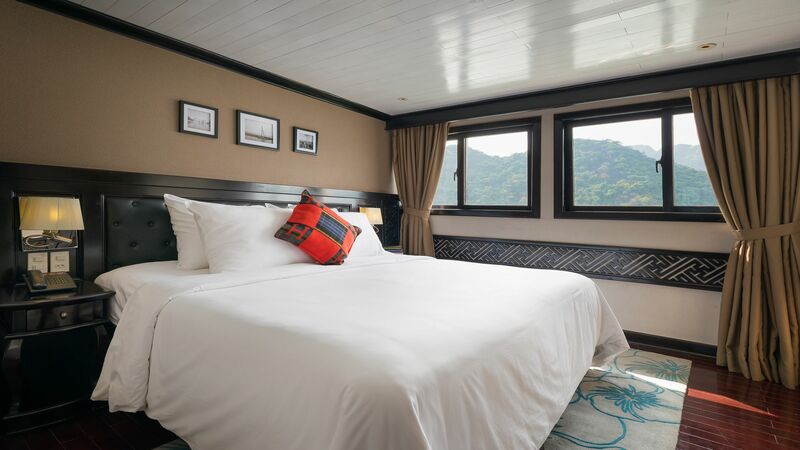 Relax in your cabin or on the sundeck, watching Halong Bay drift past. 08:00 Prepare for the day ahead with a freshly prepared and healthy breakfast. Bill settlement and check-out. 12:00 Get the shuttle bus to return to Hanoi (for people who booked the shuttle bus). 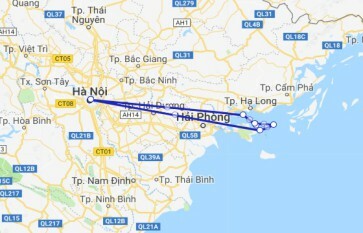 You will arrive in Hanoi at about 16.30 – 17.00. Drop-off at your hotel. End of service! I was impressed by the commitment and quick follow up by Fiona who helped arrange my transportation and cruise package within a day. She was great. This also determined my decision to pick Paradise vs other cruises/options. I stayed 2 nights and 3 days at the Paradise Luxury Cruise. 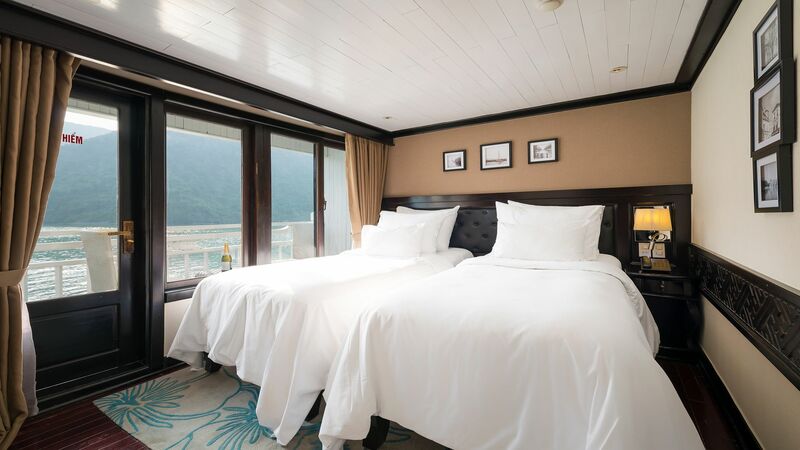 It seemed to me that Paradise Elegance and Paradise Peak have certain upgrades in the boat relative to the luxury cruise but my experience at the luxury Cruise was good overall. The staff was very friendly and willing to help at all times. Although there was some misunderstanding with my beverage package, it was solved at the end of the day. Highlight: help by Fiona from Asia Package Travel and the staff in the boat. The room was also good with good views of Halong Bay. 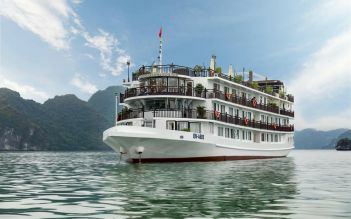 We loved our cruise with Paradise Cruises around Halong Bay - food, activities, scenery, staff were all excellent. We were a party of five and there was something for all of us. Boat - Was in good condition, there was enough room inside the boat for when it rained that it didn't feel cramped and glorious view from the top sun deck when it was sunny. Staff - Richard, Nail and the other staff were fantastic. They were attentive knew all our names and a real pleasure to be around. Nothing was ever too much. Activities - There is everything from Tai Chi at sunrise, to cooking demonstrations at sunset. We also visited Sung Sot Cave, the floating village, a pearl farm and kayaked around the bays. There was always something to do. Food - The food on the first night was definitely our favourite. The second night was a BBQ which was nicely done however wasn't quite the same as the first night. You definitely won't go hungry! 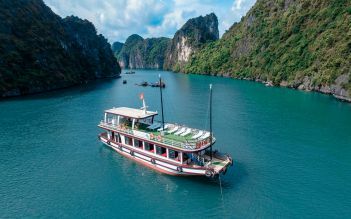 If you are looking for a relaxing way to see Halong Bay I would highly recommend Paradise Cruises. Had 2 nights with Paradise Luxury ship. Could not fault this trip from start to finish. The staff were friendly professional & could not do enough for you. The cabin was amazing, we paid for a luxury cabin which did not disappoint, it was beautifully furnished plenty of space with a beautiful en suite bathroom. The balcony was very spacious had a large sun lounger, table and chairs. The food was exceptional with plenty of choice. I would highly recommend. 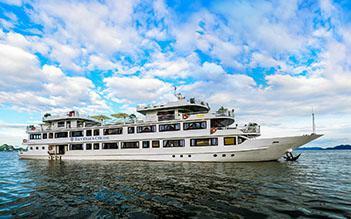 I and my friends had an amazing trip on Paradise Luxury 6888. As its name, luxury and profesional cruise with the best view from my room to the sea. Tradictional meals with many entertainments. Kayak was the best and really interesting. I felt exhausted after 400 steep steps to put my first step on the top of TiTop island. I really wanna send my thanks to Ms. Stephanie, a good & enthusiasm tour guide. She always know what we need. 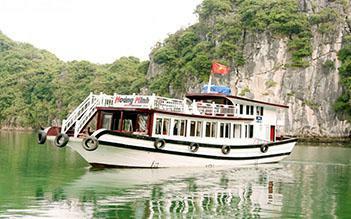 If have a chance, pls visit Halong Bay. You'll never regret the decision. And remember Paradise Luxury is the best. Wish U have a nice trip.